Next Wednesday, former Yardbirds’ guitarist and rock legend Jeff Beck turns 65. As #14 on Rolling Stone Magazine’s list of the “100 Greatest Guitarists of All Time,” Jeff Beck is considered to be one of the finest, most influential icons in music history. Beck was just inducted into the Rock and Roll Hall of Fame this April and with a resume like his, it’s no surprise why. 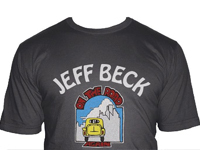 Thanks to WORN FREE, you can be apart of Beck’s history by donning his iconic “On the Road Again” or “Oh, Yeah?” T-shirts. WORN FREE is a line of stylish yet casual T-shirts that reproduces original tees famously worn by such rock legends as John Lennon, Joey Ramone, Frank Zappa, Blondie’s Debbie Harry, Gram Parsons, Kurt Cobain, and Joan Jett, among others. Each shirt comes with an individualized sticker hang-tag detailing the history behind the images and includes a photo of the icon wearing it. WORN FREE combines art, pop culture, and rock and roll into a line of hip T-shirts that really make rock history come alive. WORN FREE features some the most iconic designs and slogans of the 60s and 70s and the revival has been welcomed by a litany of celebrities such as Joel McHale, Jennifer Aniston, Robert Downey Jr, Mischa Barton, Adrian Grenier, and Naomi Campbell, who have all delighted in the chance to honor their favorite rock legends. Worn Free – be part of the story.